My Mets Journal: Bird Bath! I still love your depictions of Jerry, they are so good! The Ollie box, love it! Seriously, if the Mets win the World Series or even the Division, you could sell a book consisting of all the game's drawings. I would buy it for sure, it would remind fans of all the ups and downs and great moments of the season. I'll say it, because I've been thinking it - an amazing way to chronicle a season! Could you double-padlock that Ollie box please??? Awesome job! I love your work. You can plug up the air holes in Ollie's outhouse as well. We won't mind. So, I guess the "Ollie box" has become a favorite? The Ollie Box can now be purchased on eBay for $49.99 + shipping and handling. I love the lollie box! You should put a camera behind you as you draw one of these, speed it up a bit and put it up on YouTube. I'm sure everyone would enjoy seeing how you go about putting these together. Great work. At least he has the eye-holes to see whats going on. Thirded on buying this. Actually...even if they don't win the Series or division, I'd buy it. Good Idea Greg I may try that! 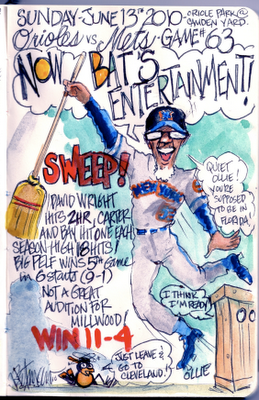 Joe, to second all of the other Mets fan your daily drawings are HI-larious! I think the idea of creating a YouTube video of you creating one of your pages would be "amazin!" I would LOVE to get a copy of a finished coffee table book if you sell one! I think there may be a screw loose on that Ollie Box. actually, i think there may be a screw loose on that Ollie. joe as a fellow artist,i love your drawings they are ridiculously creative and smart...i'd love to purchase like the rest of your followers...keep up the tremendous work!!!!!! I'd love a copy of the complete season. This would be a great flip-book to keep on the coffee table or in the bathroom... especially if the Amazin's can make the playoffs and dare I say pull off a miracle. Actually, what I'd love... is if I could have the background on my computer change every day to be the art you made of the previous nights game. I don't know how that would be accomplished, but one can dream, can't he. If you click on the picture you can get a pretty good rez sized copy that you can add a color to. Then you can make it a background. How do I subscribe to your blog so I can see each day's picture? I think you just hit the Follow button. or at the bottom it says subscribe by email.